After supper, our four year-old son stood in the kitchen and dictated the ingredients and instructions for his dessert idea. 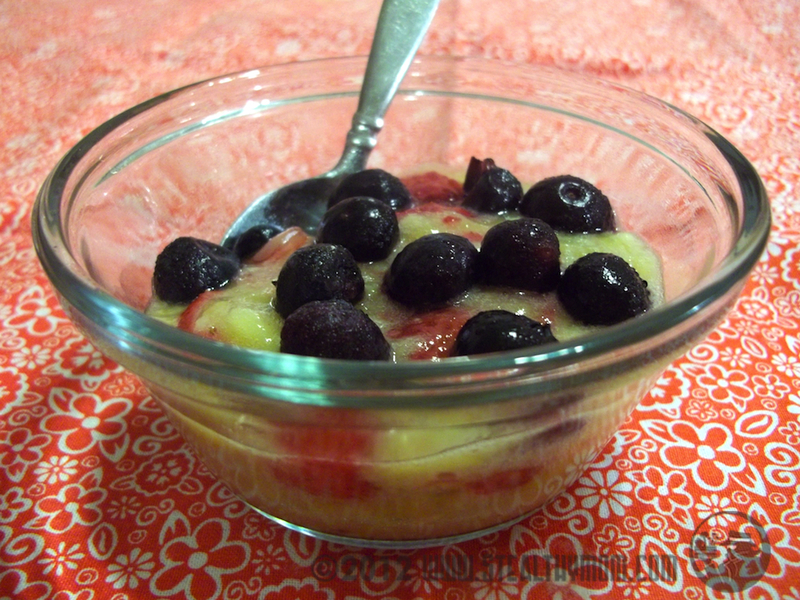 He wanted to make "Dessert Soup," with bananas for the broth and strawberries and blueberries. Smooth and creamy, this dessert was a snap to make and a delicious way to add another serving of fruit to our day. I am proud of G-man's creation! Thaw and slice the strawberries. Mash the bananas in a small bowl. Add any juice from the strawberries and whip it all together with a fork. Divide the banana puree among four fruit nappies. Top with the strawberry slices and gently swirl them in. Place the blueberries on top, then serve right away.